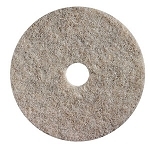 We carry the full line of Norton floor machine pads. 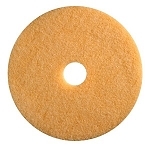 These pads are for regular rotary floor machines, and floor burnishers. Norton manufactures ultra high speed burnishing floor pads that can be used for light scuff removal to achieving a wet-look floor finish. Engineered with fibers that are durable enough to clean and use again, yet resilient enough to conform to the floor surface for better coverage. Improved pad to floor coverage means less labor time and increased pad performance. These pads help you to prolong re-coating of floor applications and maintain a high-traffic floor area for an improved facility cleanliness and overall glistening appearance. 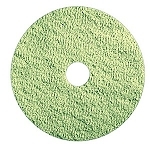 A Floor Pad Holder for use with older style professional floor cleaning machines is available. 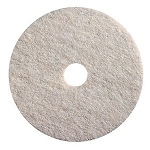 Norton stripping, scrubbing, and burnishing pads are all available in sizes to fit these machines and this holder. Norton floor maintenance pads stack up better against the competition because we make a thicker floor pad with an open web structure for longer life and less loading. Our manufacturing process creates floor pads with increased tensile strength and uniform grain distribution. And we offer the breadth of line for the broadest floor maintenance pad application coverage. But we’re more than just floor pads. Our line of food service products has expanded to help make your clean-up easier. We offer everything from hand and utility pads, scrubbers, griddle screens, sponges, micro-fiber products and more. Make us your next call.